Far better than ordinary power strips, these products will protect your expensive electronics from dangerous power spikes. We'll help you pick the right one for your home or small office. You only know for sure that you needed a surge protector after your equipment fries. Then it’s too late. For a very reasonable amount of money, you could put an almost literal firewall between your expensive (and cheap) electronics and the juice coming in from a wall socket. A surge protector throws itself into the line of fire, sacrificing its components again and again so that your devices stay functional. These reviews are of surge protectors designed for a home office or cubicle, or a home-entertainment system. Such power mediators have a single function: keeping voltage from exceeding a certain rated level, beyond which equipment can blow a fuse, burn out its power supply, or completely fry its circuitry beyond repair. 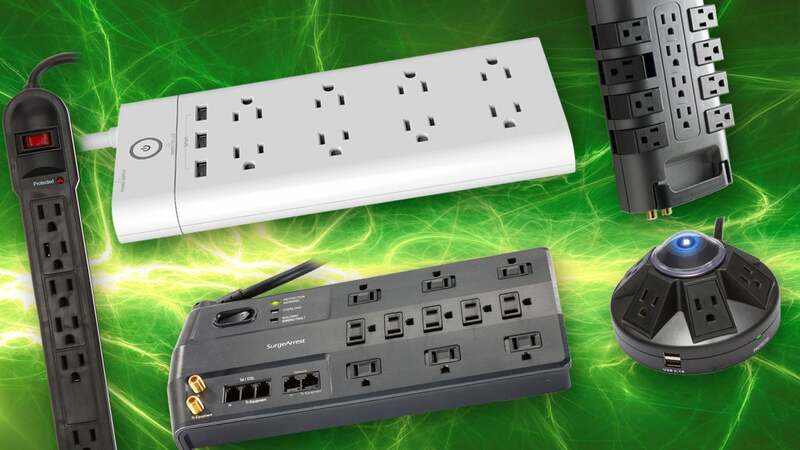 The surge protector takes a hit instead of your hardware or A/V system, and it could potentially save you hundreds to many thousands of dollars, depending on what you have connected. Updated January 21, 2019 to add our review of the Koogeek O1US Smart Surge Protector. 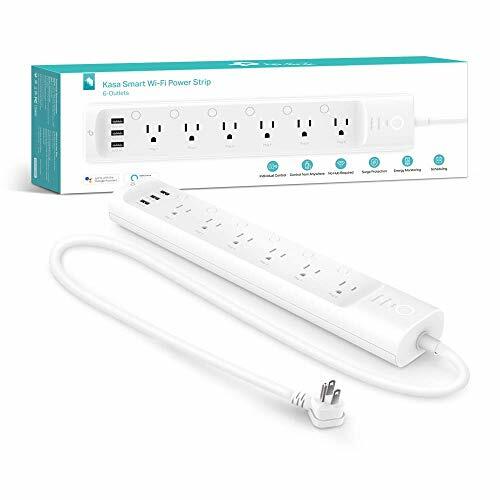 As much as we like the individually controllable outlets and the HomeKit compatibility, the fact that this power strip has just three receptacles and that two of its three USB charging ports deliver just 1.0 amps each make for a hard sell compared to our top picks in this category. Yeah, not everyone will want to drop 79 bucks on a surge protector, but TP-Link really has produced the ultimate surge protector. All six of its outlets can be controlled and scheduled individually--and with a polished mobile app, no less--and you can also control any of them with voice commands. There are three USB charging ports here, too. Yes, it's worth $79. Pivoting outlets, a low clamping threshold, high durability, and a cable organizer combine to make this a great surge protector at a reasonable price. Belkin's 12-Outlet PivotPlug Surge Protector (BP112230-08) won't cut off power when it can no longer protect your devices, but it does offer low clamping voltage (330V on all legs). This is a very flexible and adaptable surge protector, with an eight-foot cord and both protection and ground-vault indicators. With well-placed outlets and fast USB charging ports, APC’s P12U2 surge protector offers a great set of features at a solid price. APC’s SurgeArrest Performance P12U2 is our new favorite surge protector that automatically cuts power when protection ends. It’s a 12-outlet model—two more than our previous pick had—and it has two super-convenient fast-charging USB ports. If you don’t need those two extra outlets and the USB charging ports, the Tripp Lite TLP1008TEL remains a good pick for about $14 less. A solid entry that falls short in a couple of choices about continuous power and clamping voltage. APC’s SurgeArrest is only slightly less flexible than Belkin’s offering, and it won’t cut off power to your devices unless its main line-neutral protection fails. It has one fewer outlet than the PivotPlug,and it doesn’t have those fancy rotating outlets, but it is well made and its receptacles are widely spaced to accommodate lots of wall warts. We considered several common factors for three scenarios: a home-entertainment system, such as a TV, disc player, streaming media box, and receiver system; a home office or cubicle with a desktop computer and peripherals, including monitors and hard drives; and an on-the-go option, if you want to travel with a multi-outlet strip that also gives you piece of mind, especially in hotels and conference rooms, where you don’t know what kind of power will be provided. 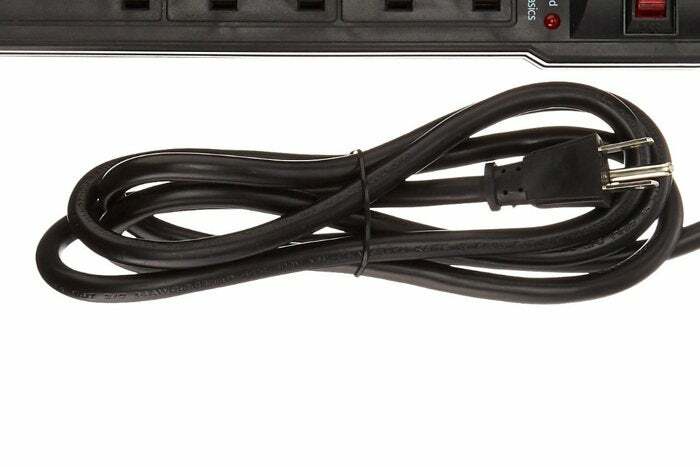 How easy is it to plug in both regular 2-prong and 3-prong cables intermingled with various kinds of USB adapters and wall warts? What’s the ratio of cost to features and outlets? For travel models, how many outlets does it have while remaining compact and versatile, in addition to everything above? Features you typically won’t find in surge suppressors such as these are alarms or networked intelligence to alert a computer (and manage a controlled shutdown), or act as an Internet of Things device, to warn about electrical anomalies or provide a status report. For that, you’ll need to step up to an uninterruptible power supply (UPS), which combines a continuously charged battery backup, power conditioning, and surge protection. Those cost from a little to much more. The electrical grid wasn’t designed for electronics, and surges and spikes used to be more regular and higher, as they didn’t affect electric motors. That’s changed dramatically over several decades, as utilities have cleaned up what’s delivered to homes and buildings. Depending on the age of a utility’s systems and how frequently lightning strikes occur, however, surges and huge spikes might be regular occurrences. The class of surge protectors reviewed here rely on MOVs (metal oxide varistors) to absorb excess voltage. A surge protector should more accurately be called “a thing that blocks excessive voltage when it exceeds a certain extreme point.” This cutoff, called clamping, is typically 330 volts (V), 400V, or 500V. While 330V or above might seem high compared to the 120V nominally delivered in the U.S., it’s not really that out of whack. Alternating current (AC) voltage centers around 120V, but it cycles or alternates from -170V through 0V to +170V and back again; 120V is the rough average. Electronics and all other electrically powered anything for a home or office can accept brief amounts of much higher maximum voltages, which you can logically determine must be true as modest surges are routine and electronic equipment in homes isn’t constantly failing without a surge protector; it’s the big surges that need to be blocked. 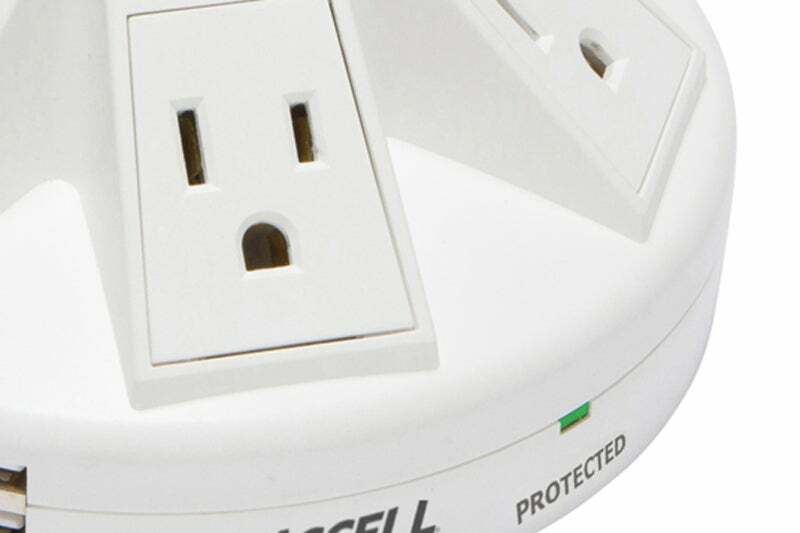 You don’t get full protection from an electrical strike with a surge protector: a strike near your home can exceed any consumer’s device’s ability to block the expended energy, though a circuit breaker on some models might trigger first. If you’re concerned about electrical strikes, you need to upgrade how the electrical feed comes into your house (or convince a landlord to do the same). 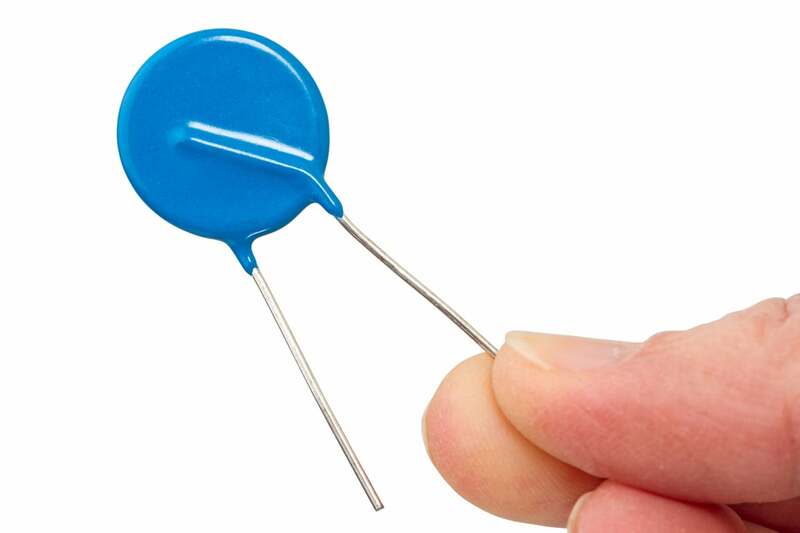 But electrical strikes miles away can induce smaller surges that protectors will absorb. Phone jacks and coax connectors on a surge protector don’t add much to its value. Some surge protectors include telephone and coaxial pass-through connections for protecting DSL and cable-/satellite-TV connections. Industry reports and testing indicates these protections are effectively pointless, so we didn’t consider their presence or absence in our testing and reviews. You can compare surge protectors’ durability, or the period over which the MOVs will remain effective, by looking at the number of joules advertised for the product. Joules measure how much energy is expended; the more joules, the more energy. So in an exactly equal situation in the same house with routine surges, a unit rated for 1000 joules should last half as long as one rated at 2000 joules. In practice, this is very, very hard to determine. MOVs don’t degrade in a perfect linear fashion, and not all MOVs are of the same quality. Joules provide a rough basis of comparison that’s nearly impossible to test in lab conditions, as you’d have to simulate a variety of surges over long periods of time with multiple identical units of each model. That’s what manufacturers do in designing and testing their products. Certification from Underwriters Laboratories (UL) provides assurance that the product has been independently tested. We’ll use joules as a rough rule of thumb, as it tends to parallel differences in price and other features, too. But when the MOVs burn out, what happens next? I’m about to blow your mind—or at least the minds of most people. If you have a surge protector already in place somewhere in your house or office, go take a quick glance at it and come back. Now, without looking again, is the “protection” light still lit? Can’t tell me? That’s a problem. Unlike the typical warning indicator, you need to be concerned when this one stops glowing. 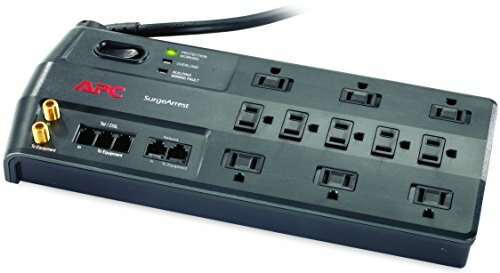 Older surge protectors were typically designed around the concern that computers had spinning hard disk drives (HDDs) inside, and that it was better to lose surge protection and keep providing power than to drop AC power when protection had failed. On surge protectors like that, the only indication of whether protection remains active is a protection light. If the light isn’t lit, the MOVs have burned out, and there’s no protection left! Now go back and look at those protectors again: which ones are burned out? Those are the ones you want to replace post haste. I confess that I only learned this in 2016; I checked mine, and had to replace one a few months later when that light suddenly disappeared. All power stops flowing, which will immediately remove electricity to all connected devices. With SSDs or streaming audio/video equipment or a Blu-Ray or other disc player, that’s not a big deal. Better to lose power than to let a surge through. Some power stops flowing. There are three different paths for electricity with AC power, and one is more important to protect against surges than the other two. (See below for more detail.) Some protectors thus only stop power passing through if that critical juncture’s MOVs die. You have to look at the protection light to know the state of protection. Power always flows, but the light turns off. In this scenario, you must stay alert, particularly during a storm and right afterwards, or whenever your lights flicker . AC power has three “legs” over which power passes. 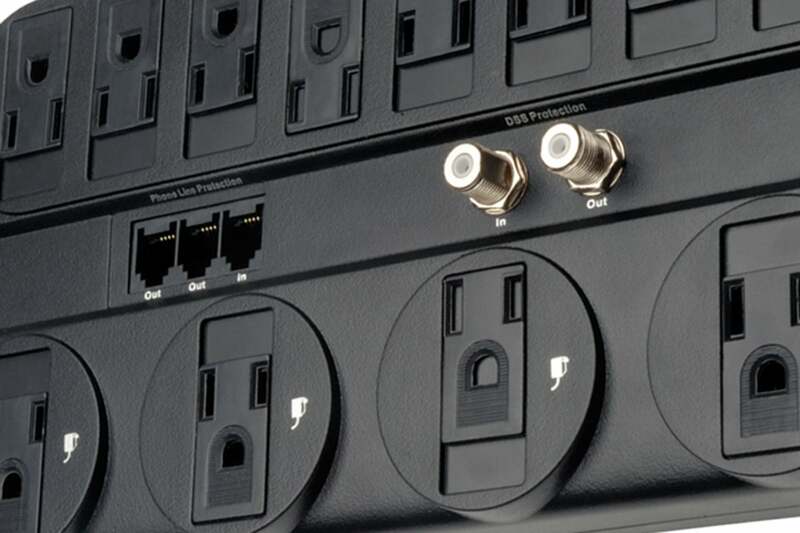 With a three-wire outlet, which is required for surge protectors, those are line, neutral, and ground. Power comes in over line and passes through neutral, and cycles through negative and positive voltage; that’s one leg (known as L-N). A long cord is essential, since your equipment might be far from the nearest outlet. Consider 8 feet to be a minimum. There’s also a leg each from live to ground (L-G) and neutral to ground (N-G), which prevent a short circuit in the wiring from causing a fire or an explosion. A proper ground wire in an outlet connects back to a grounding rod for an entire home or building that drains voltage literally to the earth. Many surge protector manufacturers offer limited warranties for damage to things plugged into the protector if said damage stems from voltage passing through to the device. These warranties (we’ve seen them offer anywhere from $20,000 to $300,000 in coverage), however, have so many provisos and exclusions—including having to apply for coverage within 15 or 30 days of damage with some, proving the right electrical setup, and providing receipts for all damaged goods—that the odds of meeting all the terms and collecting seem low. We’ve provided a sentence about warranties in each review, just so you’re informed, but don’t count on collecting unless you’re a good record keeper. One last detail: a long power cord—at least 8 feet—is a must with a surge protector. That’s because for safety and power load, you must plug your surge protector directly into a wall socket, not into another surge protector, power strip, or uninterruptible power supply. Because you can plug so much power into a multi-outlet device, it’s very easy to overload the thing into which you’re “daisy chaining” the surge protector, which can cause product failure or even an electrical fire. You also must plug surge a protector into a properly grounded 3-prong outlet. You can use one of those clever 3-to-2 adapters that I know too well as the owner of an old house, in which only about half the outlets were ever upgraded to modern standards. Don’t know if your outlet is properly grounded? Some of the surge protectors have an LED that lights up if it’s not, or you can purchase a cheap plug-in detector from a hardware store. If you find your house isn’t grounded, call an electrician immediately; it’s a hazard. Fortunately, it can be cheap to fix unless the house was badly wired. If you don’t follow the guidelines spelled out for plugging your surge protector into the wall, you can damage it void the product warranty and any damaged-items protection that comes with it. The Tripp Lite is a solid entry, and a great deal for 10 outlets with reasonable clamping voltage and power cutoff. This surge protector is just what you need if you're looking for a a model that cuts power when it can no longer offer protection. If you don't need coax protection, Tripp Lite's TLP1008TEL is the better buy. The round form factor spaces the six outlets apart to accommodate lots of AC adapters, and you charge two more devices from its USB ports. This smart switch features Wi-Fi-linked remote control of three AC outlets and two USB ports. It can be controlled via an app or with Amazon Alexa or Google Assistant. While it’s a perfectly capable product, a sky-high price and a dearth of outlets make the Koogeek O1US a second-tier smart power strip. What could be a strong product needs more documentation, more robust software, and more disclosure about its surge-protection capabilities. We wouldn't recommend using this with electronic devices. Lots of great features, but it lacks a UL Listing and other key specifications.